What is HARP? It’s the Home Affordable Refinance Program. It lets you refinance your mortgage even if you owe more than the home is worth. Your current loan has to be owned (not serviced so don’t get that confused with owned) by Fannie or Freddie and it had to be originated before June of 2009. Clink on the link below to see all the mortgages in the State of Virginia that are still HARP eligible. That’s just an amazing stat! over 18,000 loans in the state of Virginia that are still HARP eligible. And according to the web-site all these loans have a rate of at least 5.61%! 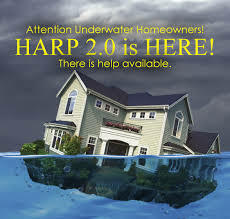 The government started a major campaign yesterday in Chicago to get the word out about HARP and encourage eligible borrowers to take advantage of the program. Although I applaud the idea, it is puzzling that the government hasn’t expanded the program to include more borrowers. One of the parameters is that your loan had to be originated prior to June of 2009. Another parameter is that you can use the program only once. Why? I don’t get the logic here. Expand the program to include all mortgages owned by Fannie or Freddie regardless of origination date. Also, make it so you can use the program as many times as you wish assuming it makes financial sense. I’ve been hoping that the government would make this change but it looks like it will not happen. In any event, if you are eligible then take advantage! FHA and FHFA Finally Getting It? I’ve been saying in my blogs for months and months how FHA (Federal Housing Administration) and FHFA (Federal Housing Finance Agency) are out of touch with the housing market and that they both need to concentrate on getting the first time homebuyers back into the market. Well, it looks like they finally are starting to listen to me! First, FHA has come up with HAWK (Homeowners Armed with Knowledge). Basically, this will be a pilot program that if the borrower completes a housing counselling class they will be able to reduce the monthly mortgage insurance 50 basis points. Currently, FHA’s monthly mortgage insurance rate is 1.35% a month (ridiculously high, it was .50% in 2009). So, the borrower will have an opportunity to get the mortgage insurance down to .85% a month (it’s a start but .85% should be the maximum, not the minimum). There are a few other advantages to the HAWK program but the reduced monthly mortgage insurance is the big draw. It looks like this will be rolled out in the fall (why not right now?) The program also states that the class needs to be taken BEFORE the real estate contract is signed. I’m hoping FHA will amend this to say that the class can be taken AFTER the contract is signed but has to be completed before closing. The second indicator that the mortgage guidelines might be loosening a bit is that on Tuesday FHFA director Mel Watt stated that maintaining credit availability is one of his main goals. He stated that Fannie Mae and Freddie Mac should direct their focus toward making more credit available to homeowners. My prediction is that within the next 6 months Fannie and Freddie will come out with lower down payment loans to get the first time homebuyers back in the market. Looks like FHA and FHFA see the signs and are moving in the right direction. Baby steps! It looks like ARM’s (adjustable rate mortgages) are making a comeback. 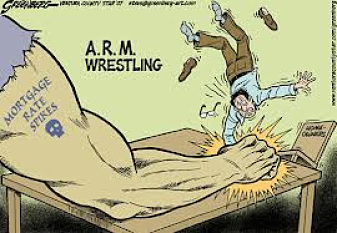 Before the mortgage crisis in 2008 ARM’s were very popular. Over the last 5 years, with rates dropping, there really wasn’t much demand for them. Now with rates rising, we are seeing more ARM’s. But banks say this time is different. In 2006 the average credit score on ARM mortgages was 693. In the fourth quarter of 2013 the average credit score on ARM mortgages was 762. That’s a huge difference. Gone are the subprime ARM’s. Not only are ARM’s becoming popular in the conforming market (loans at $417,000 or below), they are extremely popular in the jumbo market (loans over $417,000). During the fourth quarter of 2013 31% of mortgages between $417,000 – $1,000,000 were ARM’s. Let me give you an examples how an ARM might be beneficial. Lets say you only plan on being in your home for 5 years. Maybe you feel you will have a new job or you might be retiring and selling your home. Whatever the case may be, you feel there is little risk in either refinancing to a 7 year ARM or buying a new home with a 7 year ARM. Currently, the 7 year ARM rate is roughly 1.125% lower than the 30 year fixed rate. On a $200,000 loan that’s $128 a month and $10,752 over 7 years. On a $400,000 loan that’s $257 a month and $21,588 over 7 years. On a $700,000 loan that’s $448 a month and $37,632 or 7 years. That’s a lot of money! The other reason banks are saying this time is different is that it’s much harder to qualify for ARM’s now. Whereas in 2006 borrowers were being qualified at the start rate, now most ARM’s qualify the borrowers at the start rate plus 2%. Factor in the higher credit scores and banks feel the adjustables no longer carry the high risk they did prior to the mortgage crisis. So, on your next purchase or refinance at least take a look at an adjustable. It might work perfect for you. One of the downsides to the mortgage crisis has been the reduction in options that are now available to first time homebuyers. Fannie Mae and Freddie Mac have basically eliminated all their zero down payment loans as well as their 3% down options. The best program going now is USDA but under the USDA program your home needs to be rural and there are also income restrictions. So, what’s left? FHA. FHA use to be a great option. Prior to 7/14/2008 the down payment was 3%, the monthly mortgage insurance was .5%, and the upfront fee was 1.5%. Now, the down payment is 3.5%, the monthly mortgage insurance is 1.35%, and the upfront mortgage insurance is 1.75%. On a $200,000 mortgage that is an increase in the monthly payment of $144 a month! That’s a ton of money. Plus the borrower would have to come up with an additional down payment of $1000. Well, The Community Home Lenders Association (CHLA) wants FHA to reduce the monthly mortgage insurance and get the first time homebuyer market going again. Their recommendation is to decrease the monthly mortgage insurance to .75% and decrease it to .5% if the borrower successfully completes a counseling session pre-approved by the Department of Housing and Urban Development (HUD). To offset the reduction in revenue because of the lower monthly premium, the group proposed to temporarily increase the upfront fee to 2%. The group also proposed that as FHA’s financial status improved to meet its 2% reserve requirement for its Mutual Mortgage Insurance (MMI) fund, then the annual premium should be reduced to .5% for all borrowers. What a great idea! If the housing market is going to recover then the first time homebuyer has to get involved. 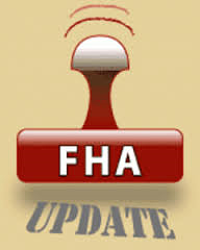 The options are currently weak and FHA needs to step up to the plate. Lets hope CHLA will help convince FHA to make some changes.